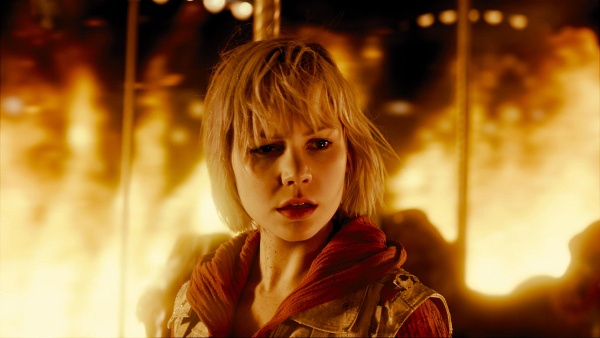 The Silent Hill: Revelation 3D trailer has finally arrived, so you know what that means! Time to do a frame-by-frame analysis of the trailer in order to find its little secrets. I have gone through the trailer in search of possible story clues, locations, monsters, etc. I also provide my own theories on what the film will be about and how scenes will play out. Hopefully you will find this analysis useful as it took a hefty chunk of my day. While I did not like the Comic-Con clip all too much, I liked this trailer. It came off very campy. I’m not sure what the actual movie will be like but if the trailer is any indication, then it will be good visual fun just like the previous. As for the story and characters, I’m not too sure. I can see myself disliking Vincent a lot if he sticks to being a needless tag along character with annoying lines. Claudia may have a small role as well, which disappoints me. As for Heather, I think Adelaide is doing OK with the role. 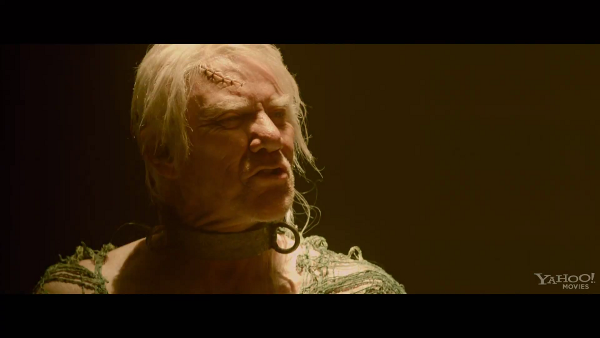 Some of the scenes came off a bit overly dramatic, but like I said, if the film is campy, that will be OK with me. Might as well have some fun with what I like rather than spending too much time complaining on what I don’t. This is only just one trailer so there is much to left to my imagination. I look forward to seeing the full film once it releases on October 26, so that I can can fully and accurately judge it. 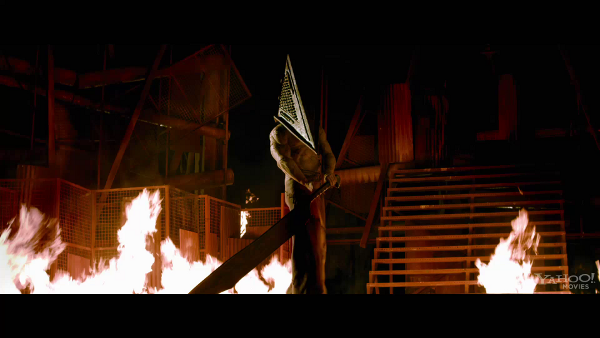 [00:14] The trailer wants to establish that Pyramid Head, pointy fan service man, is back. He seems to have gained a little weight. 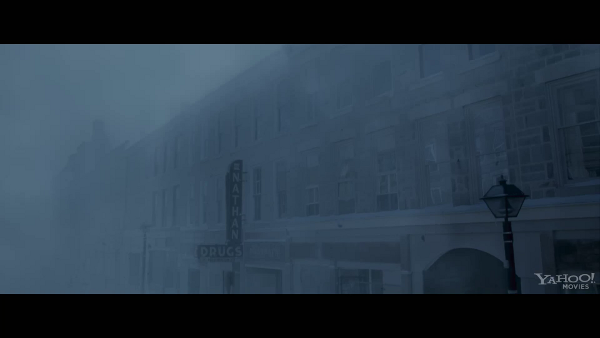 [00:15] Here we have an establishing shot of the very same street from the first film. Nathan’s Drugs is the indicator of this. 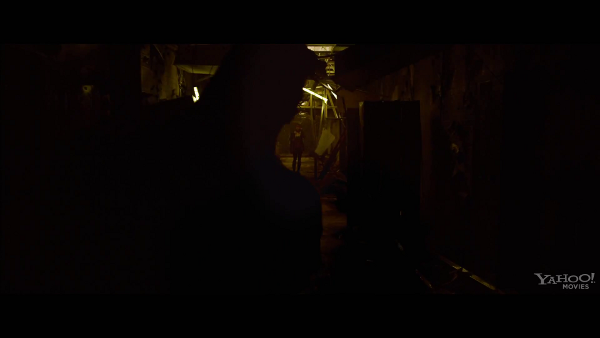 [00:18] The trailer begins with showing the town’s evil in its current form: Dark Alessa. 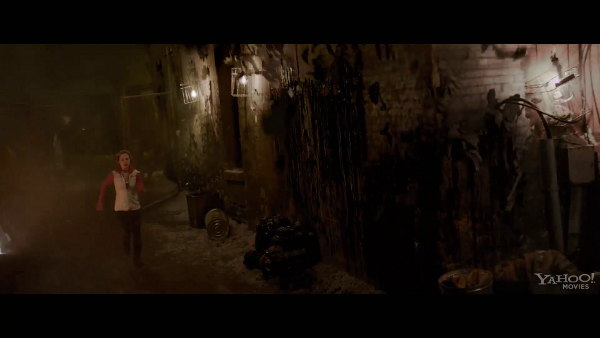 As Dark Alessa walks down a street of Silent Hill, she brings what appears to be an Otherworld transition. I’m less inclined to believe that it’s a normal transition, because it seems much more violent. Perhaps she is cleaning up the remaining survivors of the cult that burned Alessa. I am not too sure when this scene is taking place, but I believe it to be during the events of Revelation. How and why there are still survivors in the town is something I’m not sure of, but I’m thinking that these people are survivors of the cult seen in the first film (their clothes seem to be about the right type). [00:21] Heather (or Sharon as her father calls her in private) awakens from a dream. 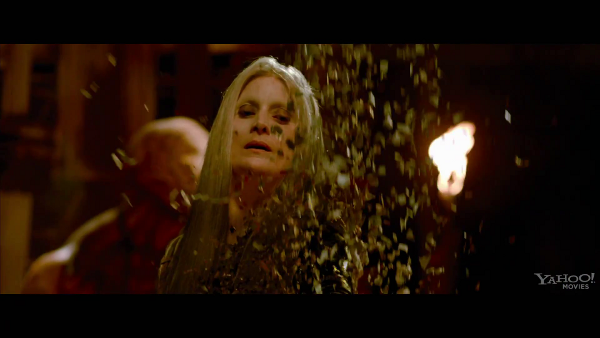 While the prior scene to this one could have been from anywhere in the movie and not actually a dream sequence, I think it is actually from her dream, and not an editing thing. I feel that it would be an appropriate scene of Dark Alessa calling to Heather through her dreams which is what was done in the first film. As for what Dark Alessa wants, that is hard to place a finger on. I’m sure a lot of people are glad that Heather didn’t scream “Silent Hill!” in her sleep. In the first film Dark Alessa tries to call to Sharon by making her sleepwalk off of a clif. If Rose and Christopher did not stop her, she would have died. Dark Alessa wanted her to die in order to achieve something. Dark Alessa shows no interest in Sharon up until the end of the film, but clearly does not get what she wants because Revelation continues the story. Perhaps something limited her. Rose’s love? Her Godliness in Alessa’s nightmare? “Mother is God in the eyes of a child.” Dahlia said at the end of the first film. God can not be beaten…yet. 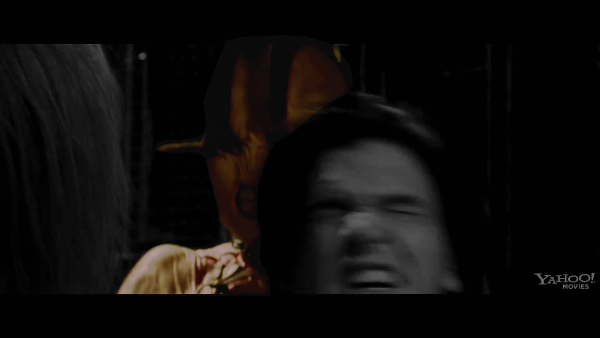 Hence the reason why Rose is still in Silent Hill. She could only protect her child. Perhaps she even sacrificed herself for Sharon’s soul. Six years have passed, and Dark Alessa needs Sharon to come back in order to achieve her goal. Perhaps she is looking for a way to bring herself into the real world? Does she need the daughter of the girl whom she had corrupted as a way out? If Dark Alessa controlled The Otherworld, she didn’t really hinder her efforts to kill Rose up until Rose made it to the hospital. From there, she used Rose to achieve what she promised to Real Alessa: revenge. Real Alessa got what she wanted but Dark Alessa did not. In Revelation she might be using the remaining religious fanatics as her servants. They have repented God and now worship her. Thus The Order is born. Claudia may be Dark Alessa’s best servant: a liaison to the real world. [00:32] Heather is living a somewhat normal life. This being her first day in school, she tells her new class that this would be her fifth school, because she and her father move around a lot. It doen’t seem like Christopher has good taste in where he moves. I don’t think Detroit is any safer than Silent Hill. [00:38] This shot establishes Heather’s school hallway. Fellow students walk the halls while Heather appears lost. Based on how the shot transitions, Heather most likely stops walking to read the piece of paper in her hand. Probably a class assignment sheet. Doing so leaves her alone in the hallway. [00:43] The Otherworld has found Heather. For a brief moment, Heather is pulled into an Otherworld version of her school. Just like the game, this shows that the Otherworld knows no bounds and can exist outside of the town. To Heather’s horror, a Lying Figure enters the hall and starts to approach her. Now we know that the Lying Figure is one of the returning monsters along with The Nurses. [00:48] This is where we meet the film version of Vincent. As opposed to a priest in The Order, the film version of Vincent is a High School student in the same school as Heather. This greaser with a New York accent snaps Heather out of the Otherworld when he surprises her. It’s assumed that Vincent offered to walk Heather home after he found her so distressed. What a nice guy he is. 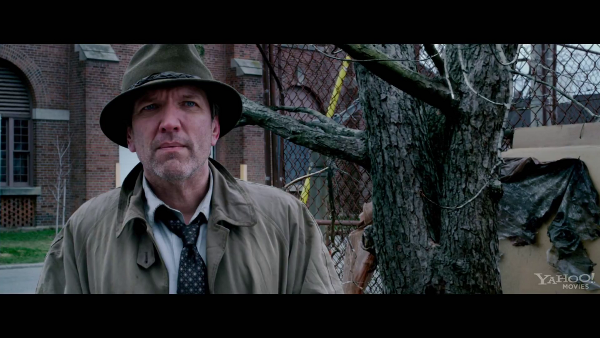 [00:52] Detective Douglas Cartland is watching Heather. If he’s doing the same as he did in the game, then he has been hired by Claudia and The Order to find Heather. When Heather sees Douglas watching her, she decides to call Christopher. Because she says she thinks she’s being followed, she might have seen Douglas multiple times throughout the day (assuming the call of Silent Hill happens on her first day of school). I’d like to point out how well they recreated Douglas’ attire. It looks pretty much exact. [00:59] This appears to be the point in which Christopher has been found and abducted. 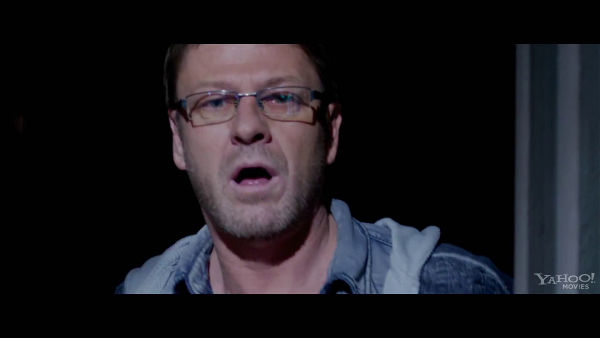 Poor Sean Bean. [1:06] When Heather arrives home along with Vincent, she finds no trace of her father. She only sees a message painted onto a wall of her home. The message tells Heather to return to Silent Hill. Beside it is a Halo of The Sun symbol. Vincent, who’s still by the door of her apartment, comes in and sees the cryptic message. Vincent, being the cool guy that he is, decides to join Heather on her nightmarish adventure to Silent Hill–probably looking for some more of that black nightmare ink on the wall, to use in his hair. 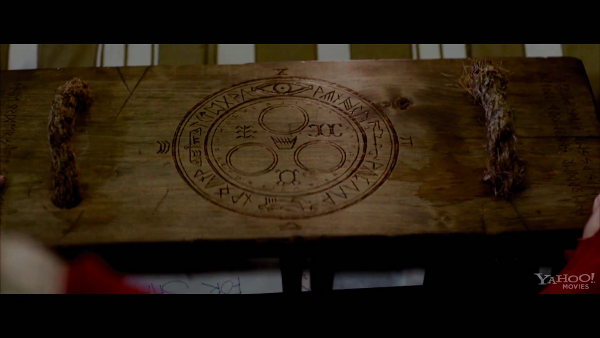 [01:12] Heather recognizes the symbol on the wall and looks for a box that Christopher must have had in his possession since the events of the first film. I’m going to hypothesize that Christopher found this box sometime after the events of the first film. Perhaps when he found Sharon, this box was left somewhere in his home by Rose. In the box there is a piece of paper with the following exposed letters ” For Sha..”. One can guess that the message spells out “For Sharon”. A scary box addressed to Sharon and Christopher is not something I’d expect a terrified father to keep a hold of. That is why I think Christopher believed the box came from someone he trusted: Rose. [01:16] The thing addressed to Sharon is the Seal of Metatron. The trailer does not show any hint of Heather being pregnant with a God fetus or of her carrying a piece of Aglaophotis. This leads me to believe that Bassett has dropped the “Birth of God” storyline in favor of something else. The Seal of Metatron will actually hold power and be of use in the film, unlike in the game. 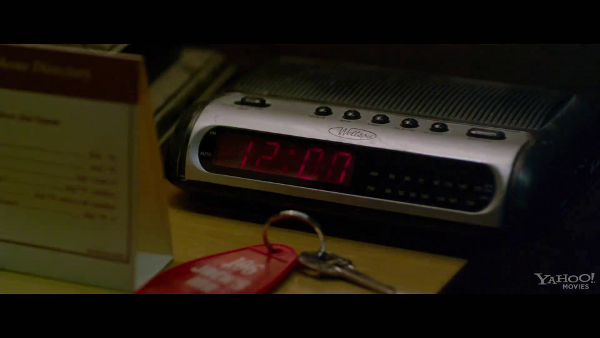 [01:17] This shot establishes that Heather and Vincent are in a motel. Room 106 in Jack’s Inn. They have taken a rest while on their way to Silent Hill. The rest is most likely a short one. [01:21] The two probably don’t have much time to rest before The Otherworld creeps in. The world around the motel room has become industrialized and rusted. This scene will probably be one of the first direct transitions from the real world to The Otherworld. Here’s hoping this scene won’t occur right before the two almost share a romantic moment together. That would just be too predictable. [01:24] Here we get a look at a new monster exclusive to the film. 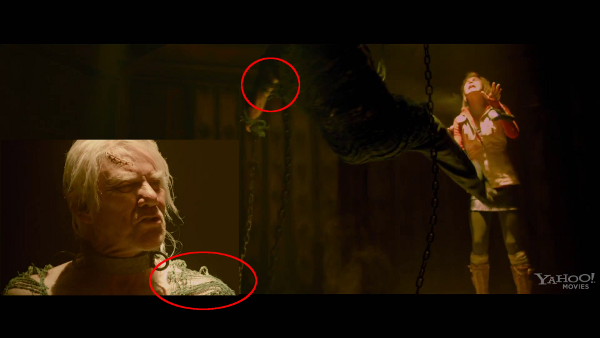 The monster appears to be female and a close relative of the Hellraiser Cenobites. Her flesh appears to be stretched around her body. Exposed muscle can be seen around her upper chest area. She also appears to have something protruding from her head. I am thinking that she will look a bit like a Rawshock from Shattered Memories, just a lot more Clive Barker-ish. [01:26] Heather exits from her motel room. I’m inclined to believe that after the motel transitions to The Otherworld, some stuff happens, and then she ends up in the Fog World. From here she makes her way to the town on foot. What this scene also tells us is that Heather and Vincent went from the real world, to The Otherworld, and then the Fog World. They have entered the town’s parallel reality before they even reached the welcome sign. [1:33] Order members can be seen in the windows of Silent Hill’s buildings. They appear ghostly. Perhaps they’re all dead because of Dark Alessa’s rage. [01:35] Dahlia appears in green attire. Something about her gives me the feeling that she’s somehow better off than when we last saw her. Her actions don’t entirely suggest this, because she still seems tremendously sad, but she is still unafraid of Alessa’s power. Her green clothes are much brighter than the other people in the town. Perhaps she has been blessed, anointed, or is protected in some way. She also appears to be holding something with a chain in her hands. 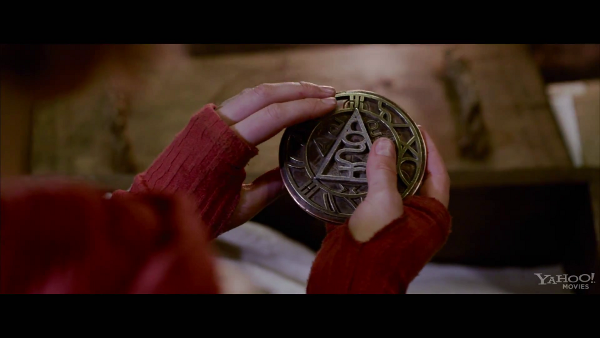 This might be the locket with the picture of Alessa from the first film. 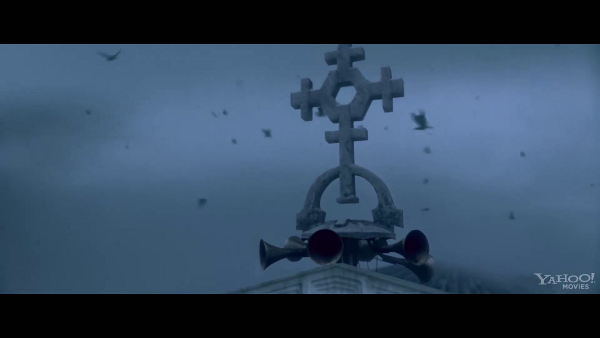 [01:36] The church from the first film begins blaring its siren–The Otherworld approaches both Heather and Dahlia. Dahlia tells Heather to run. “It’s safer to be inside,” Dahlia tells Heather. [01:40] We get a good shot of the streets of Silent Hill within The Otherworld. 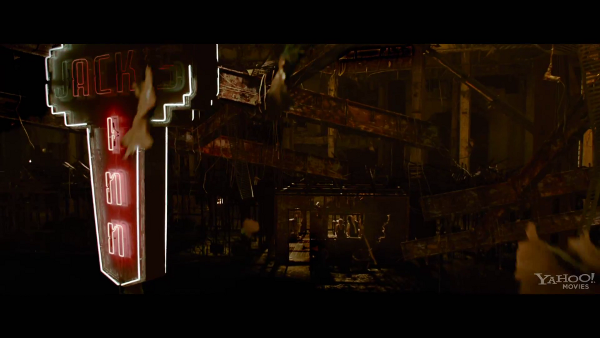 The first film didn’t show how the town looked during a transition. The closest we saw was the scene before everyone entered the church. [01:46] A victim of the new spider-mannequin monster exclusive to the movie. A clear shot of the creature is in the next screencap. [01:48] The spider-mannequin reminds me a lot of Scarlet from Silent Hill: Homecoming. Porcelain over sinewy muscles can be spotted on the creature. It’s exposed joints looking bloody and raw. It’s also quite fast. This monster is supposedly the only monster to have been CGIed up. That’s great news for fans of animatronics, costume, and puppetry. Knowing that the film has real people in costumes makes me happy. [01:49] The mysterious Suki character can be seen in this particular scene. She and Heather are both terrified of the mannequin monster. Leonard reveals the purpose of The Seal of Metatron. 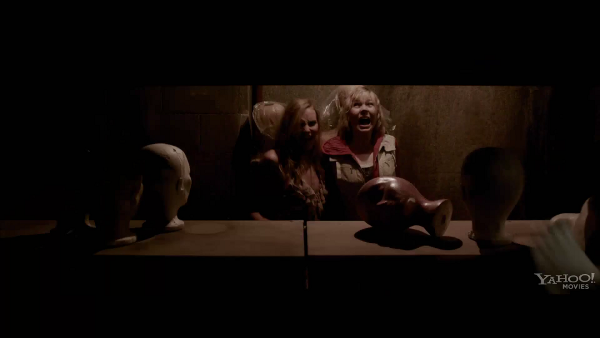 A clip from Dahlia shows her tell Heather than she was chosen to destroy the demon that poses as Alessa. Heather has been chosen to destroy the demon. Was Dahlia the one to summon her back to Silent Hill? Dahlia is the only good person left in the town, so this might be a possibility. [01:57] I’m not sure why Pyramid Head is cutting off a whole bunch of arms, but it probably has to do with a ritual. Perhaps they’re his prisoners. 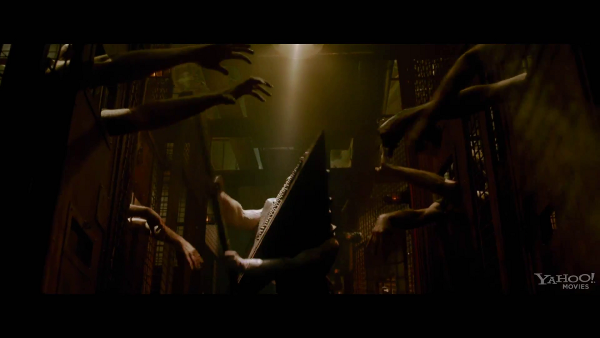 [02:01] Pyramid Head can also be seen doing somewhat of Valtiel’s role. 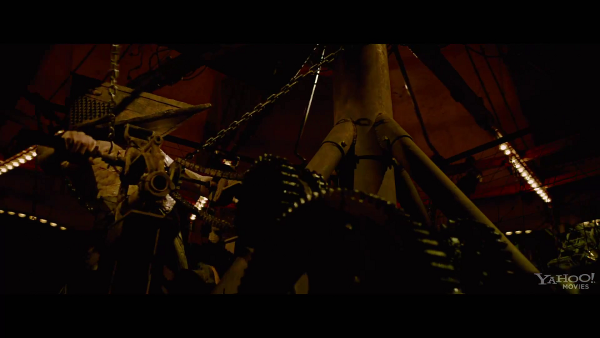 Here we see him crank the mechanism that controls or spins the carousel in Lakeside Amusement Park. [o2:03] A first look at The Order in full ceremonial clothing. 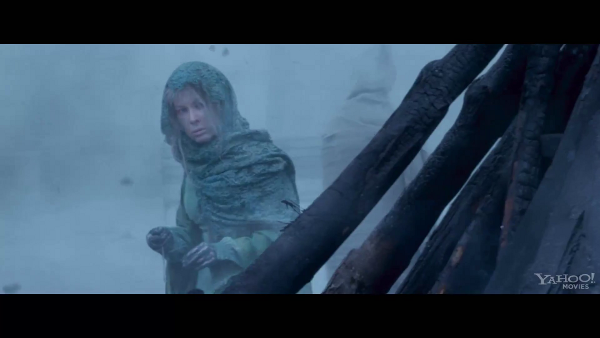 They wear clothing similar to the Sect of the Holy Woman Order members from Silent Hill Origins. [02:05] Here we see how Vincent found himself in the room filled with Nurses. I won’t go over much of this scene since it was shown off at Comic-Con. There’s also not much to analyze. The only thing to mention here comes from watching the separate clip that was released. In it, Heather barters for information with Vincent’s freedom. How does Vincent know where Christopher is, and why is she reluctant to free him? Well, it seems that the clip they showed us spoiled Vincent’s true intentions. He may not be a bad guy, but he was definitely lying to Heather. [02:10] What appears to be cultists are surrounding the carousel. Perhaps they are conducting a ritual and the carousel is a part of it. [02:13] I may be wrong here, but I think the man that flies back from Heather is Leonard. I came to this conclusion because it seems his clothing is similar; it’s torn and stringy in the same way around the arms of both figures. Leonard also clearly has a chain around his neck. There are three chains on the figure to the right. One for each arm and one around the neck. [02:14] Dark Alessa’s face is front and center here. Instead of having more expressive eyes like she did in the past, her face is devoid of emotion. Her eyes are pitch black. I’m not sure why this demon insists on keeping the likeness of Alessa, but it has become more devoid of human characteristics. Heather gives the demonic version of her child self a good yelling to. Will Dark Alessa speak or will she be mute? I’m inclined to believe that she speaks, but most likely very little. [02:15] Here she is, Claudia Wolf has finally made her appearance. I love Claudia. She’s just so dark and twisted. At this moment in the trailer we see Heather and Claudia both hold The Seal of Metatron. Claudia is undergoing some sort of transformation as she touches the seal. As her white clothing burns away, black attire is revealed. Could this be Claudia revealing her “true nature”? Was she hiding it at some point in the movie? Will Claudia be transforming into a monster just as she did in the game, or is her role limited to that of a high ranking Order member? We don’t even see Claudia until the last few moments of the trailer. 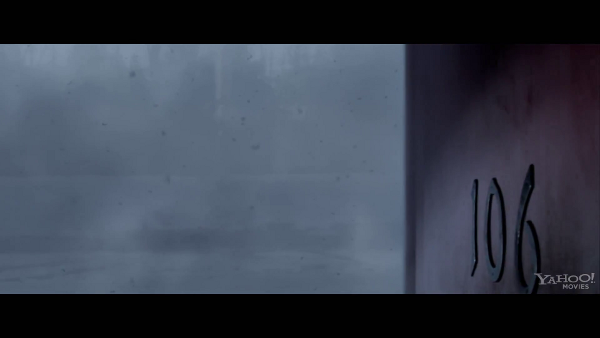 Based on this trailer, I’m getting the feeling that Claudia is not the antagonist of the story, Dark Alessa is. I wonder how much of a role Claudia will have in this film. Hopefully one of enough importance that shes granted ample amount of screen time. Behind Claudia, Christopher can be seen sitting below a statue of Valtiel. I’m thinking that the true form of Dark Alessa is actually Valtiel. It would explain why Valtiel is a status of worship at the ceremony, why he’s not seen moving around in the trailer, and the importance of the seal’s power to “reveal the true nature of things”. In order to kill Dark Alessa, Heather must use the seal to bring out its true form. The form that we know as Valtiel in the game. [02:19] For some reason The Order has prisoners. 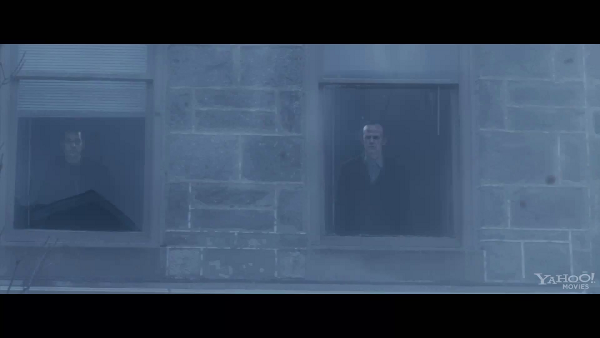 Are they residents of the town that were pulled into the Otherworld when Alessa’s nightmare began or are they members from the first movie’s cult? Which ever group this guy belongs to, it’s clear that he does not like Heather. 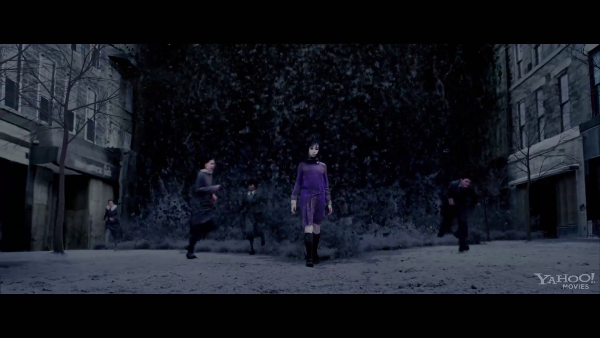 I’d think that the cult from the first film would want the daughter of Alessa killed just as much as The Order would. While one group wants to destroy the demon and anyone who they consider evil, the other worships evil and need Heather dead for their unknown plan to be realized. Wouldn’t it be great if he turned out to be Stanley? 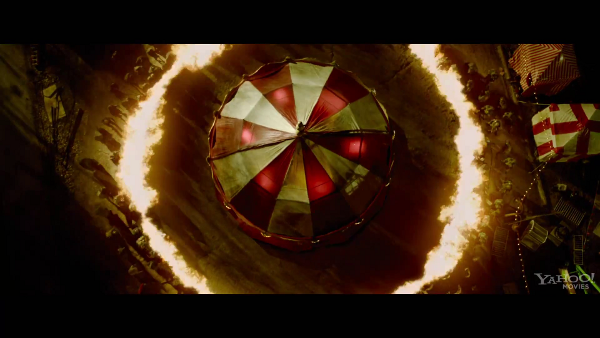 [02:20] As the trailer closes, a shot of Heather on the carousel is shown. Around her mutilated horses bob up and down. The horses appear to be burned rather than mounds of stretched and mangled flesh. There are a lot of scenes on the carousel, so I’m betting that we will see a conflict similar to the one in the game. That’s about all I can think of for now. If any of you spot something, tell me in the comments. I will update this analysis if more things come to mind.